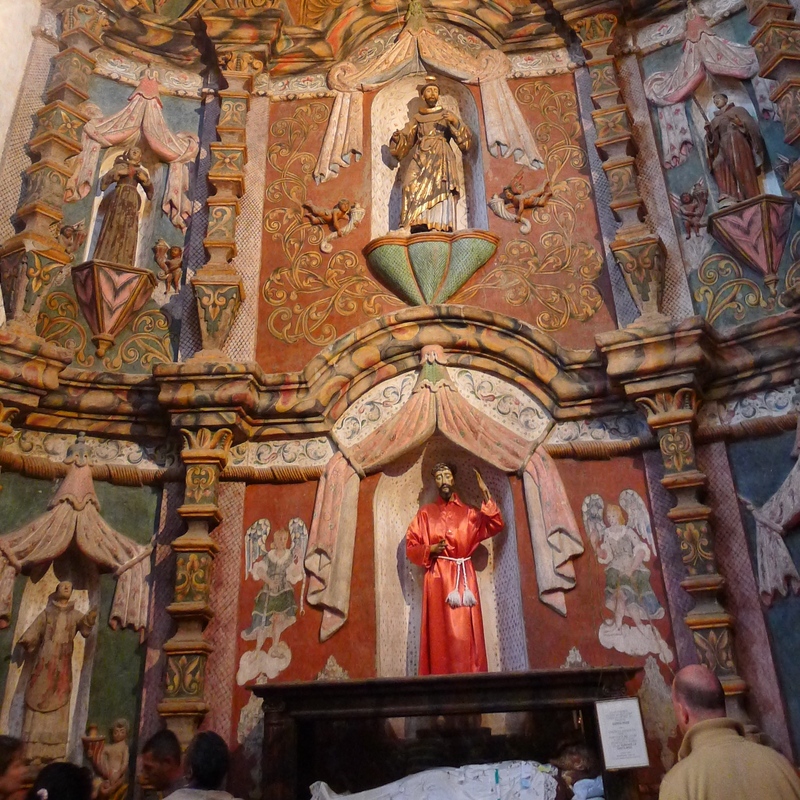 The KBI was a joint apostolate of the Jesuit Provinces of Mexico and California. It provided humanitarian aid to undocumented migrants deported from the Nogales, Arizona border. The KBI took its name from Fr. Eusebio Kino, the Jesuit missionary-explorer of Nueva España, the one who built the predecessor of this church. Fr. 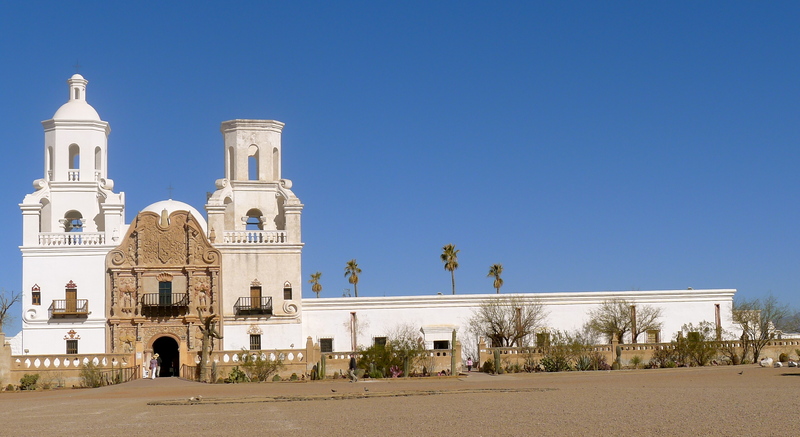 Kino arrived at the Indian village of Bac in 1692. The people there seemed to be open to conversion, so he built a mission church that he named after St. Francis Xavier, the Jesuit who became the patron of the missions for his work in Asia. In the late 1770s, the Franciscan missionaries took over when the Jesuits were suppressed. They began to build this present structure with a cruciform floor plan. They built it with a 7,000 silver peso budget borrowed from a local rancher. 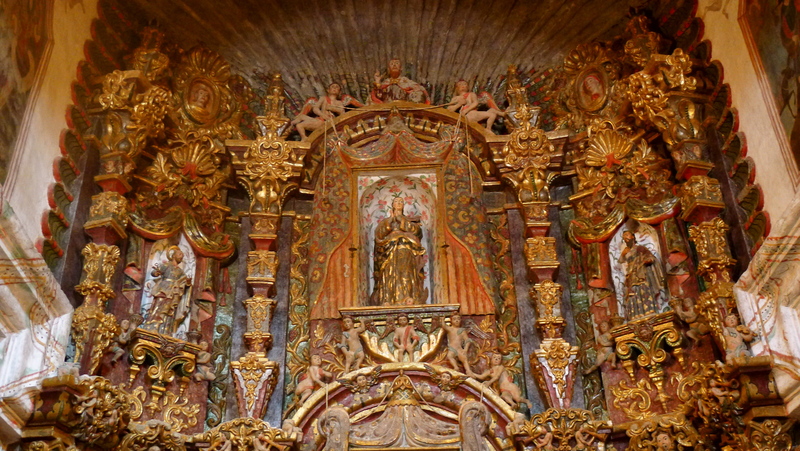 They invited artists from Querétaro, a town north of Mexico City who worked with Indian laborers to sculpt and paint this extraordinary Baroque interior. I was awed at the interiors. With mouth agape, I took pictures in frenzy: wide-angled, close-up, or macros in portrait or landscapes. 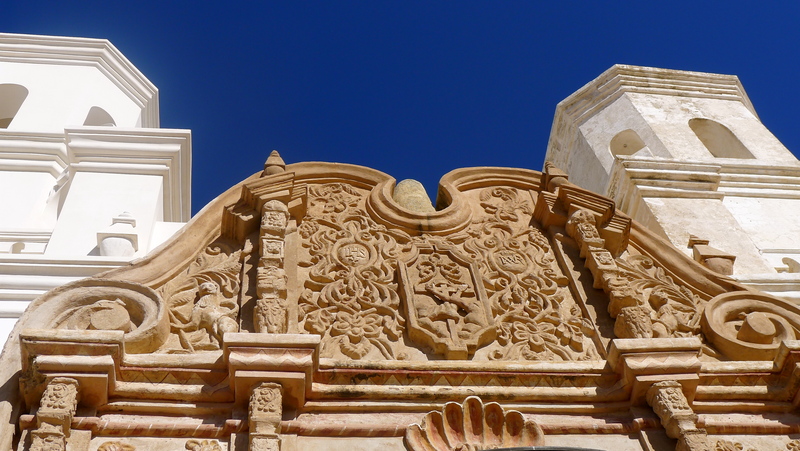 It was already stunning to be at the white exterior of a massive church at the center of an Indian reserve, but it was more intense to be inside of it. I was more than impressed. But I felt that that was exactly the effect of Baroque architecture of the 17th and 18th century. The extravagance of ornate details seem to send the message to the Indians — and to all visitors of the present — how big and lofty Christianity was. So, check these photos, and tell me if I have all the reasons to wonder. 1. 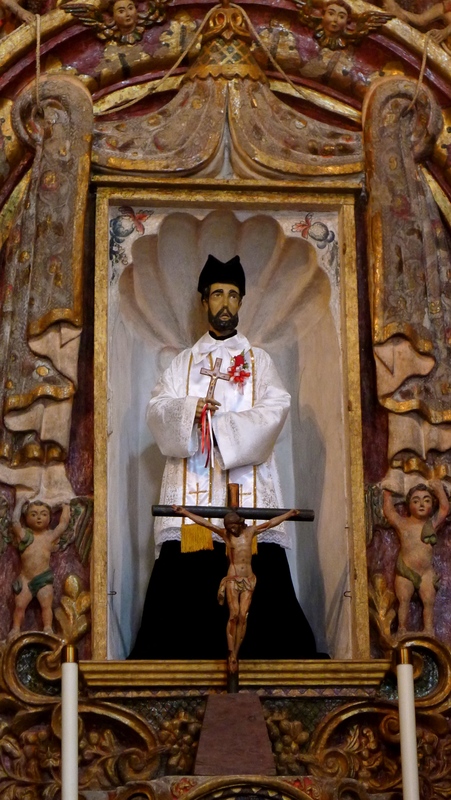 A 1759 statue of St. Francis Xavier at the center of the retablo (right photo). 2. 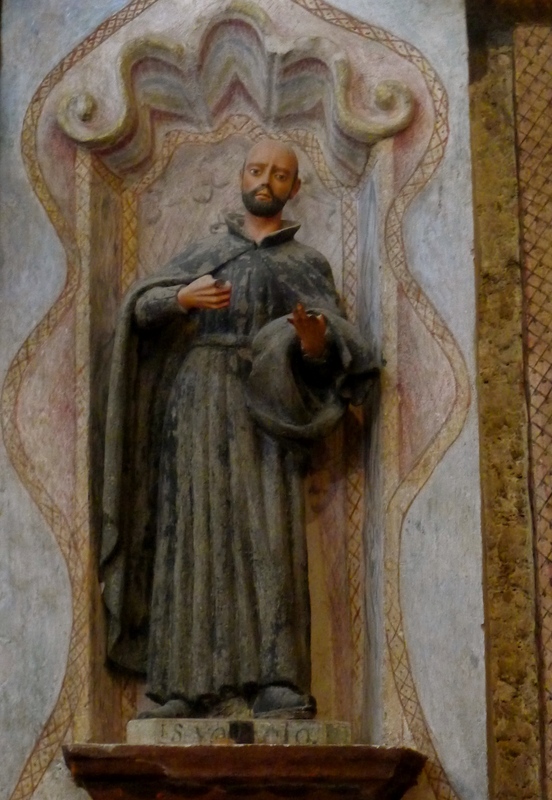 St. Ignatius of Loyola (left photo). 3. 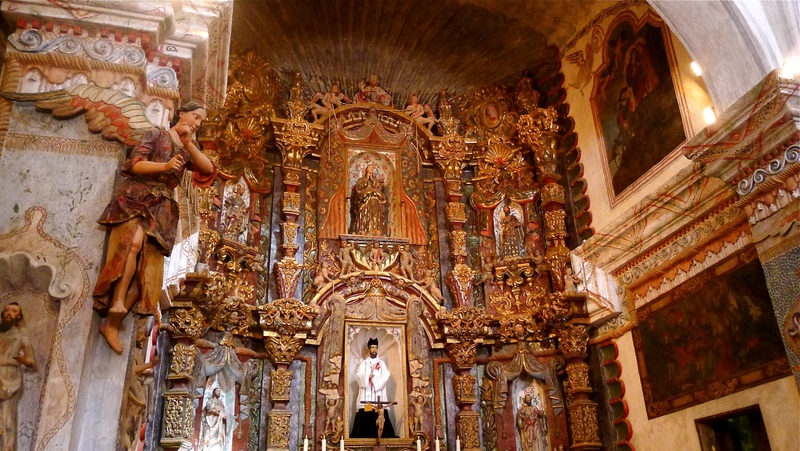 This is the bier that held the statue of San Francisco who turned the mission into a place of pilgrimage (photo, below). 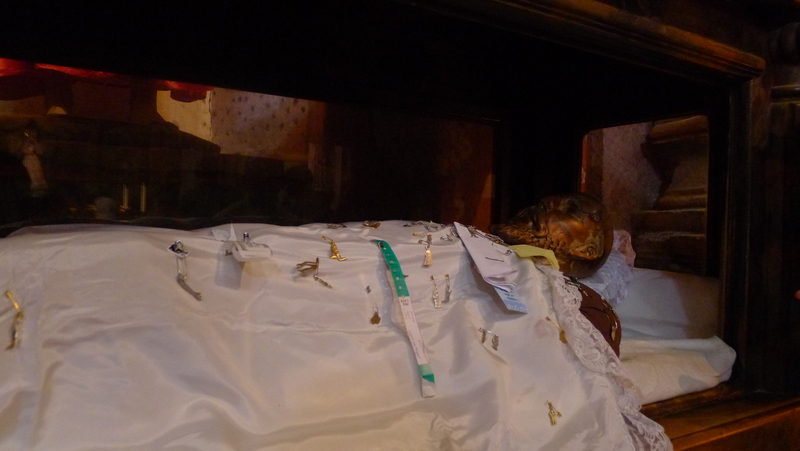 As one of the pilgrims who came to this place years ago, I also had more than a dozen petitions, except that I did not have what other pilgrims were leaving behind: a token of devotion, pinned on the robe of San Francisco Xavier.